A calorie-blasting barre workout that targets your lower body and keeps your heart rate high! 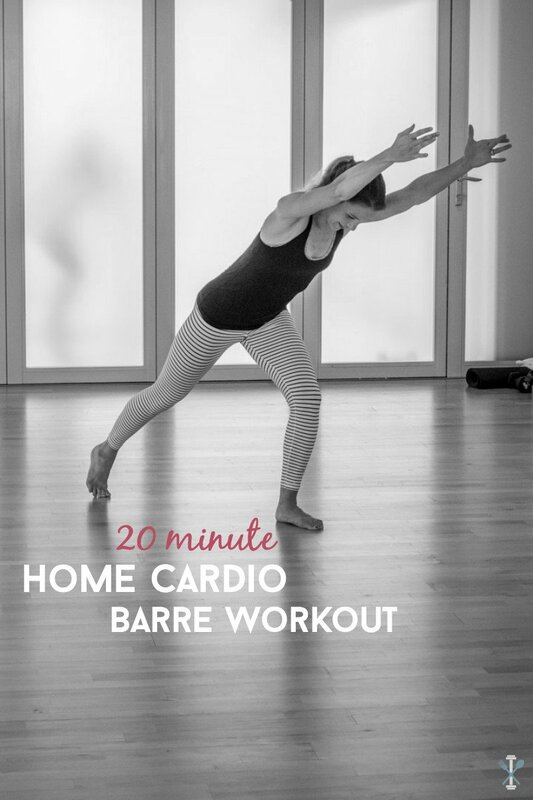 This 20 minute home cardio barre workout is the perfect way to tone and sculpt in the privacy of your own home. Ok, if you haven’t figured it out by now, I’m a barre junky. I’m totally biased (since I’m a barre instructor), but I admit, I’m full-fledged obsessed. I feel totally lost if I don’t get a few barre workouts in every single week. It’s gotten to the point that every time I do dishes, I want to stand in relevé. Every time I hear a song with the perfect beats per minute, I want to sink down into a wide second position and start pulsing. Every time I do any booty work, all I can think about is tucking. Complete each of these six exercises four times through, as fast as you can, with no break in between! You got this. And if you’re loving the leggings, be sure to check them out here, and use the coupon code physicalkitchness for 20% off your entire order! Start with your feet hip distance apart and lift your arms overhead. Next, lift your left knee to your chest as you bend your arms into 90 degree angles, then twist your upper body slightly, bringing your right elbow in towards your left knee. As you lower your foot back to the ground, extend both your arms overhead. Then switch sides. Do 12 repetitions as fast as you can (counting each knee lift as one). Start with your left foot planted in front, right foot behind your body as you lean forward slightly, ensuring all your weight is distributed on your left leg. Raise your arms overhead, then quickly bring your right knee in towards your chest as you bend your arms inward (elbows in towards your knee). Extend back out and repeat 12 times, then switch sides and do an additional 12 repetitions as quickly as you can. Start with your hands in prayer, directly in front of your chest, toes forward. Step your feet out wider than shoulder width apart, right heel off the ground, left foot planted flat. Think of tapping your right foot three times, once out wide, the second ‘tap’ in towards the midline of your body, the third ‘tap’ closer inwards. After that third cap, jump up as high a possible, using power from your left leg to lift your body as you extend your arms overhead. Then land back into the wide squat, staying on the ball of your right foot (never letting your right heel touch the ground, even as you land). Do the ‘3 taps/jump’ for 12 repetitions, then switch sides for 12 more. Do this as fast as possible. Using the back of a sturdy, high char or countertop, place your palms on the back of the chair or edge of the counter. Step your right foot back and across your body (executing a curtsy lunge) with your left leg in front, both knees bent in 90 degree angles and heels lifted. Next, extend your left knee and lift your right leg out to your right side, knee up near your right shoulder, hips open. Place your right leg back down and across your body. 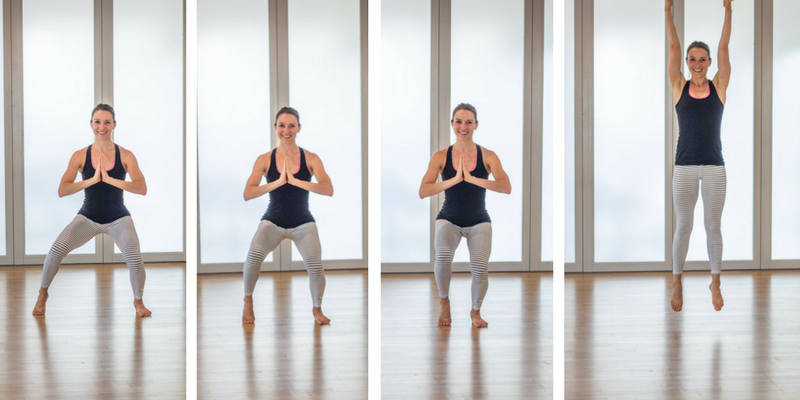 Repeat 12 times as quickly as you can, all while keeping your heels off the ground (feet always in relevé). After 12 repetitions, repeat the same sequence on the other side (left leg lifts). Start with your feet hip distance apart, full arms distance away from the barre (or counter, or chair). 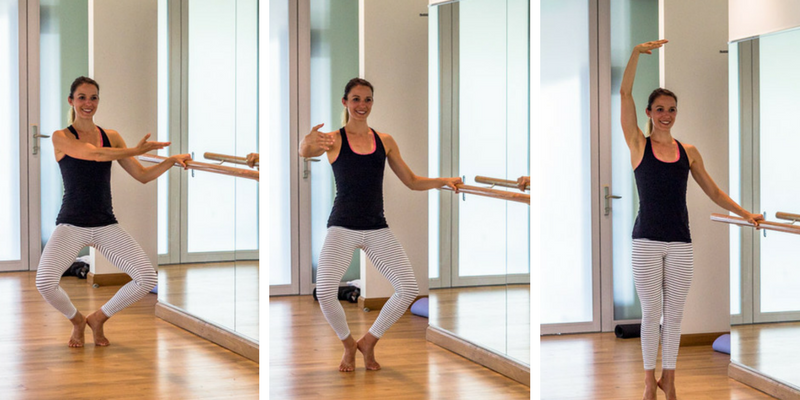 Lean your upper body forward towards the barre as you swing your right leg back behind your body, making sure your leg is straight and extended. Swing your leg back down to meet your left ankle (but not dropping the right foot to the ground), as your upper body lifts back to vertical. Next, press your right toe to the back of the room, keeping a 90 degree bend in your knee and hips tucked (rolled forward slightly) to eliminate any over exaggerated sway in your lower back, targeting your booty. Bring your right foot in to meet you left ankle like the second photo, then repeat the entire sequence 12 times. Switch legs for an additional 12 repetitions, doing this as quickly as possible. Start facing the side of the room, left hand lightly gripping the chair or countertop. Step your heels together and high off the ground, toes apart, then bend your knees to bring your body as low as possible. Sweep your right arm across your body, directly in front of your chest. Next, start to extend your legs and you sweep your around and out to your right. Continue extending your legs (squeezing your booty at the top of the extension), and lift your right arm overhead. Bend your knees deeply and bring your right arm across your body like the first photo and repeat this entire exercise for 12 repetitions, executing it quickly and bending into your lowest challenge position at the start of each rep. Switch sides to work the opposite arm the next round, alternating sides each round. After you’ve completed all the exercises, start over and do the entire circuit four times through for the best 20 minute home cardio barre workout ever! 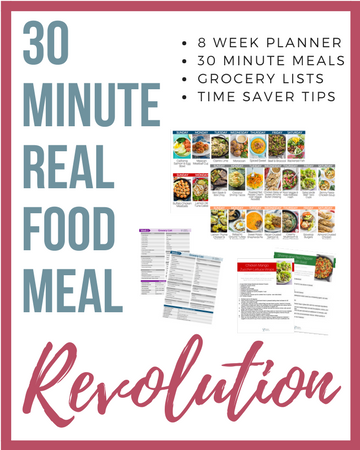 This may take you more than 20 minutes, depending on the speed at which you execute, but it’s a workout you certainly won’t regret! Love barre? 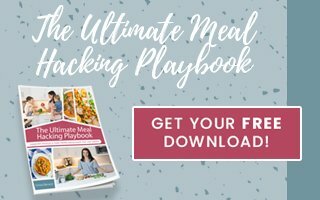 Try these workouts posted on Physical Kitchness – Sculpted Barre Arms Workout, 10 Minute Express Barre Workout, Moving Barre Stroller Workout, Kettlebell Barre Combo Workout, Barre Booty Home Workout, and this One Move for Insanely Toned Legs killer! Looking for more cardio workouts you can do at home? I have those too! Check out this Insanity Inspired Workout, Cardio Blast Summer Workout, No Equipment Home Cardio Workout, Lower Body Cardio Tabata, and this 30 Minute Home HIIT Workout! I am excited to try this workout! I did a trial Barre class a few months ago and really liked it. I’m just curious, do you need to have significant experience with Barre to eventually become a teacher? I thought it would be a fun side job and helps you stay fit lol. Hmmm good question. That would really depend on the studio – at first thought, I don’t believe you need signifiant experience, but definitely well-versed in barre workouts. Every studio and franchise is a little different in what they require and how they train. Sure that makes sense, thank you! I will contact my local studio. This is awesome!!! I haven’t been to barre in a while, but I’m half marathon training right now and need a good once-a-week lower body strength routine that isn’t too time consuming – enter this workout!!! Glad you can put this one to good use Laura! Love your barre workout pics, I travel a lot, so I am not able to go to class often; would love to know if you have any videos?